It’s that time of year again. What time is that you ask? Halloween of course. What better way to celebrate than with a thematic entry for such a spooky day. You’ve seen one zombie, you’ve seen ’em all, right? Wrong. Look at this guy. He’s all f-ed up. It’s tough being an awkward, teenage zombie – living (or is that un-living) in a state of a pimply puberty. Even his eye and navel are oozing. Poor kid. He’ll never know the taste of a woman’s brain. 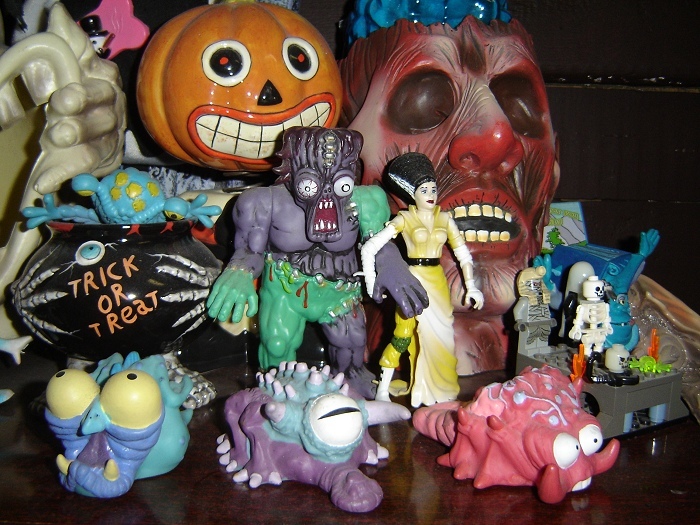 So, running a blog dedicated to “weirdo toys,” pretty much means I can virtually feature anything from my collection for this “special” Halloween edition. I finally decided to feature this little fella I bought a couple of years ago. Unfortunately, I trashed his packaging, so I have no record of what he is (it’s before I knew I’d be doing this blog 😉). 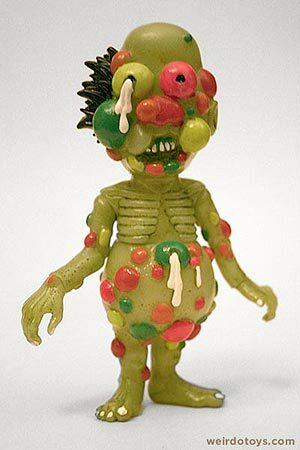 I think a friend informed me that he’s part of a series of figures based on freaky zombie characters by some Japanese illustrator. At the moment, I have no info other than “Planet Toys Made in China”, but I’m working on it. 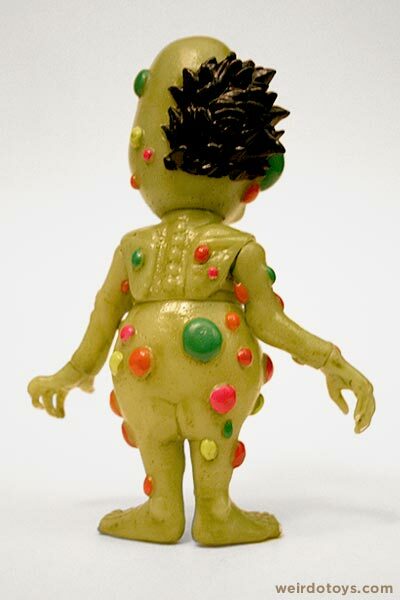 Thanks to some information from Jonathan at www.bogleech.com, I now know that this weird toy is a character from the mind of horror manga artist, Hideshi Hino. His name is Zowroku, and he belongs to a toyline that includes two other Hino characters, Hell Baby and Dokumushi (the “Bug Boy”). I also found some images of the toy packaging. I knew I shouldn’t have thrown it away. Homer gone for a skinny dip? Where in hell do you find these things? “He’ll never know the taste of a woman’s brain.” Classic. 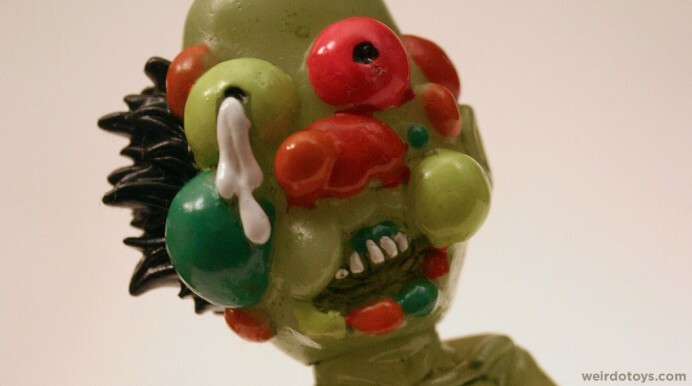 There’s also one more figure in the line, a really gnarly Frankenstein’s monster! FM is another monster who suffers from the same generic look across thousands of interpretations, but Hino did a really nice one! I’d love to get a good look at the Hideshi Hino version. “Bride of Frankenstein April O’Neil” is having second thoughts about the arrangement. Thanks Scythemantis. 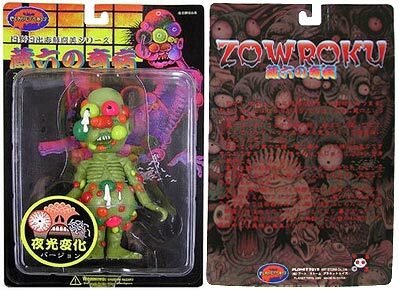 It’s always great to see more cool/freaky toys form fellow collectors. Thanks for sharing. Frankenstein’s monster, but with a different paint job on it.